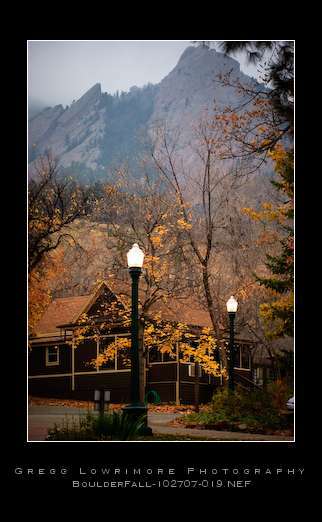 When I arrived at Chautauqua Park, I started out by just walking up and around the Chautauqua Auditorium, taking pictures of the houses, the Flatirons, and the streets covered with leaves. 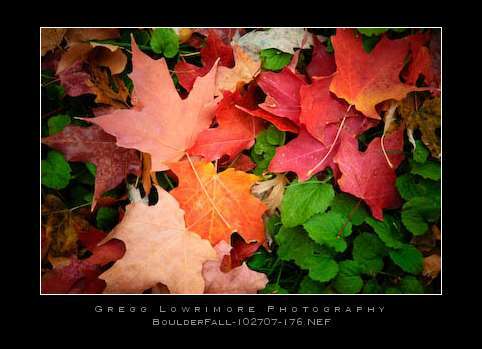 On my walk around Chautauqua Park, I found many interesting things and lots of photographic opportunities. And with the overcast day, I couldn’t have asked for better conditions to shoot. 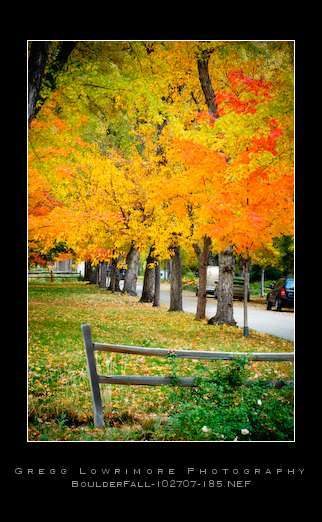 My wife keeps telling me to head over to Mapleton Street to see some wonderful fall colors and I always said I would, some day. Well this year, that “some day” happened. And aside form the beautiful homes (circa 1900 in some cases), the street is divided by a middle median that’s covered with green grass and lined on both sides with Maple trees. 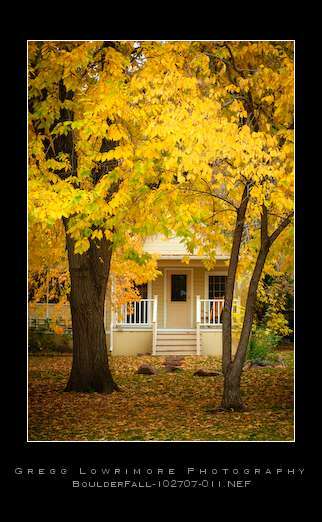 Couple that with trees lining the curbside of the street and you have a canopy of trees covering the whole street. 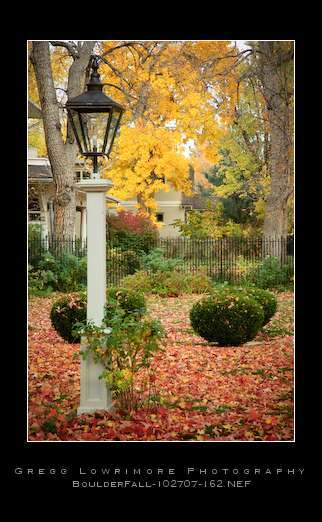 There were reds, yellows, greens, subtle browns and the colorful architecture to shoot. I’ve never filled an entire 2GB CF card on one walk before! 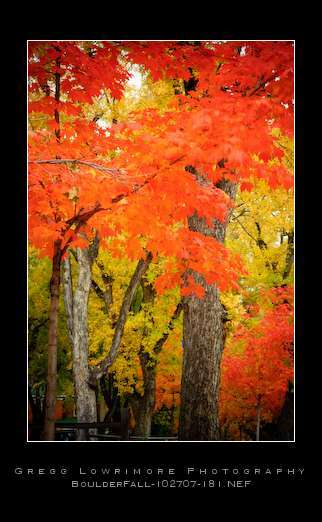 Beautiful colors abounded everywhere. I even ran into a fellow photographer by the name of Norman Koren. You should check out his Imatest software over at his web site. 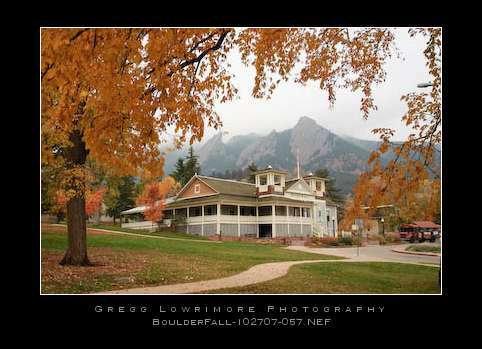 He’s got wonderful photos too as well as all the Boulder hightlights and things to see and do in Boulder. 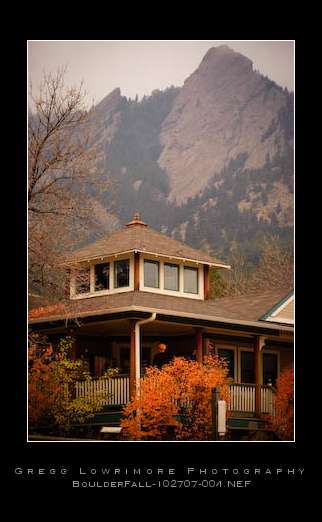 Posted in Shoots and tagged aspens, boulder, chautauqua park, colorado, colorful, cottage, dining hall, fall, flat irons, flatirons, light post, maple, mapleton street, Mini Gallery of Images Found, Norman Koren, ranger station, street lamps, trees, yards, yellow by greggl with no comments yet.